Monday, January the 21st, with the meeting Citizen Science Lab: Air Pollution about to start. Participants being welcome at the Lorentz Center, in the city of Leiden (The Netherlands). During the first two days of the meeting, different experiences and case studies addressing air contaminants and Citizen Science are presented, as an inspiration for the teamwork to come. Tangible results are expected: the proposal of joint projects as a result of splinter group working sessions. Projects, which will be evaluated and scrutinized on basis of their novelty, cross-disciplinarity, team composition and commitment... and of course, the practical viability of the project. A mixture, yes, of ambition and pragmatism. Preceded by an overview of the subject, thanks to the many speakers. First, snapshots on the European Commission’s point of view, by Sven Schade, from the Joint Research Centre (JRC), institution which aims at bridging the gap between academics and politicians. Outstanding Citizen Science projects involving many participants are presented: "SenseEurAir", "GBIF", "City Nature Challenge", "BioBlitz", "Atlas of Living Australia" and "Birdlife International"... some of which have already started exerting influence on European politics. Roeland Samson talks about the project "Airbezen", in which pollution levels at different locations of the Belgian city of Antwerp were monitored using strawberry plants distributed among citizens. The collection and analysis of their leafs led to new insights regarding city air quality: it is interesting to find, that the close to 75 % of plants that made it to the final analysis (the rest being lost) suggested that air quality was worse than officially reported. Christian Nold, from the ExCiteS group at UCL discussed about ontologies, presenting afterwards a repertoire of sensors available to the citizen scientist: the "Air Quality Egg", the "Smart Citizen Kit", "Wide Noise" and "Air Probe", amongst others. A repertoire, which was further broadened by the talk by "OK Labs", displaying a selection of resources for CS in the context of air pollution: monitoring kit, an Open Data platform to obtain and process data, and sensor personalization tools. Stemming from the words of another speaker, Lea Den Broeder, one infers that Citizen Science may have a particularly high value in low-socioeconomic communities, potentially strengthening the social fabric. Practical hurdles to be overcome can include a limited access to electronic devices (read: smartphones), or a low technological literacy. But there is yet another problem to be tackled: how to get and keep the citizen interested and motivated? Health, it seemed, is a good unifying focus of interest, and an attractive enough concern to many. Alas, sometimes the problem addressed by CS is not necessarily the most important benefit: the social impact of the creation of an environment for citizens to meet and discuss issues affecting them all, could be even more important than the actual data collection process. Next, a glimpse about the air quality situation in Pristina (Kosovo), by Ron Salaj, of the "Science for Change" Movement. In their spotlight, initiatives aiming at educating citizens about the importance of air quality, with a special emphasis on school children. In parallel, steps are being taken for the identification of highly polluting sites. Curiously, during a communication act of the project, an unexpected casualty occurred: a mannequin used for message delivery was arrested (true story!). Christine Strous, from the Lung Foundation, talks about the reality of lung cancer and asthma in Europe, and their causal relation with air pollution. Pollution, of which NO2 and particulate matter (PM) are two major, well-known actors. This is yet another talk with a little surprise: attendees are told that air pollution can come, indeed, from unexpected sources. Particulate matter (PM) due to the poultry farm industry in The Netherlands now matches up with that emmited from traffic or factories! After this, by the hand and voice of our speaker, we are left with yet another sentence worth of being food for thought: "we never breathe the annual averages". With the talks slowly coming to an end, Nuria Castell, from NILU, provides a comparison of advantages and disadvantages of traditional versus low-cost CS air monitoring solutions. The high expertise requirements, high operation and maintenance costs, and sparse network of the professional sensors are confronted with the cost-effectiveness, portability, simplicity, and the potential to cover a much wider area of low-cost sensors. Yet, data accuracy and reliability lie on the side of professional equipment, as well as the existence of a generally more structured, and extensive data history. Verdict? Two complementary approaches. The final speaker, Ivonne Jansen-Dings from the Waag Society, describes the co-creation mindset, in anticipation of splinter sessions. Requirements: being critical, experimental, somewhat fearless, flexible, hands-on, optimistic about outcomes, and sensitive towards each other (and about detail). Contributing to a smooth flow and goal creation during the co-creation process, a number of techniques were explained: a) Ambition Ranking, in which participants dynamically allocated and modified the importance rank of different goals (until general agreement was reached); b) Visualize App-frame: which aims to devise a visual scenario of a certain situation; c) Iteration Dice: a resource to unblock development, to be used when people developed an idea block; d) Crazy eigths: in which people fold an A4 paper three times and then spare a minute to fill each of the resulting eight paper sections with concepts which may be relevant (or not) to the problem at hand. Participants organised into groups to prepare brainstorming. Before starting the tplinter sessions, though, the "World Café" discussion session was opened with two evocative questions: “What was your first encounter with citizen science?” “What is the most important societal issue that CS could address?” Thereafter, the actual working group discussions starded. Focusing on one of the groups, it resulted in the proposal: “Indoor Air Quality Monitoring”. The idea was initially proposed by Dr. Wolfram Birmili, being the main driver factor, that most of the people spend their time indoors. It would hence seem reasonable to expect that indoor air quality would be one of the main issues affecting their health and/or quality of life. The finding that there is a lack of research on this topic added further interest for digging more into this topic. 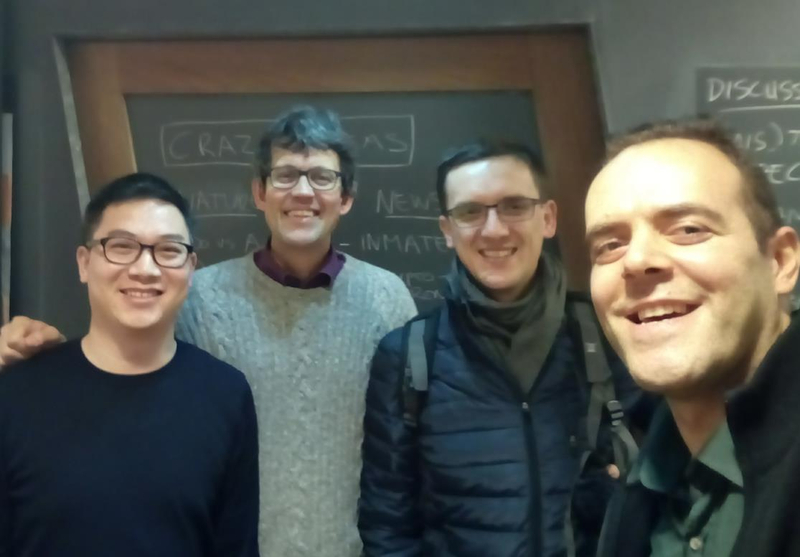 Group of Wolfram Birmili, Dr. Lea den Broeder, Qijun Jiang and Damian Zieba and Berk (Figure 4), with the entousiastic support later on of Dr. Jeroen Devilee and Frank Kresin. The prior experience of Dr. Birmili and his research group had already yielded the creation of a sensor which is depicted next. 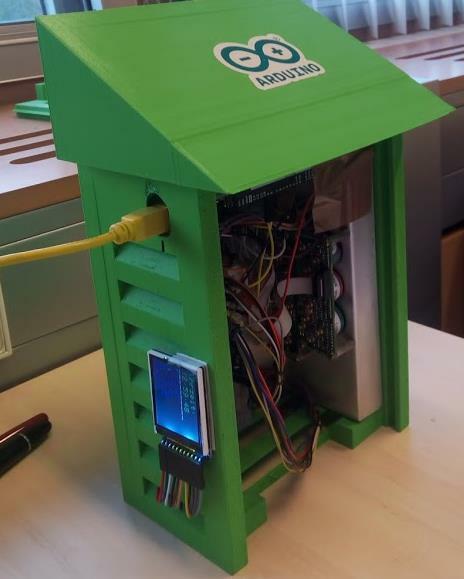 The device, consisting of a 3-d printed box, with in-house devised electrical components, could measure various parameters including NO, NO2, CO2 , CO, SO2 , O3, temperature, humidity, and particulate matter (PM). 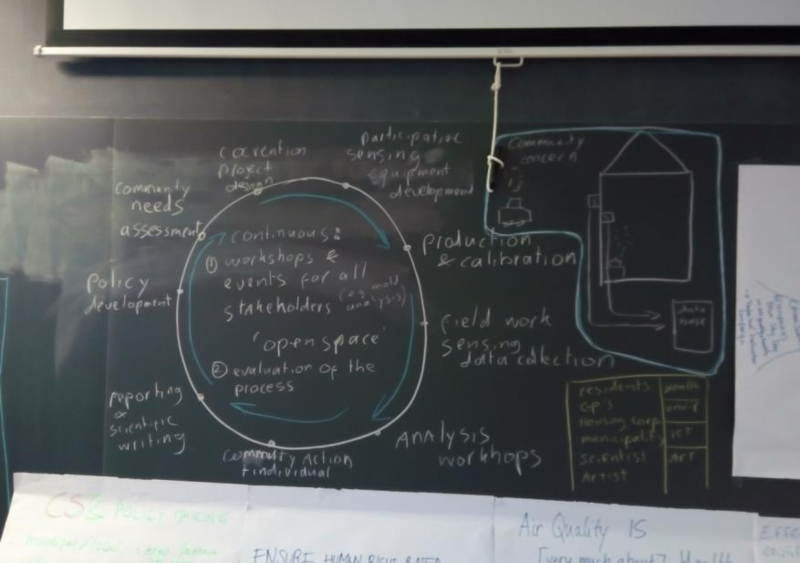 Building on top of this asset, the classic sketch-and-write on the blackboard approach dominated in the group discussions, occasionally combining it with some of the techniques proposed during the plenary meetings. The final project, eventually, took shape! -At the heart of the project, create a space for the community to gather, where citizen scientists can assess their needs. -Build up the project by co-creation procedures. -Participative sensing step: get citizen scientists to know what to measure, and why (for instance: “am I exposed to unsafe levels of NO2?”). -Data collection: citizen scientists gather months of data. At this step, external data from other sources can be integrated. For instance, medical records, professional monitoring records, and so forth. -Data analysis: citizen scientists supply their measured data to the community starting discussions on their meaning. Next: translate this information into useful actions. a) Observe actions previously taken by the citizen scientists and the community in general to improve their indoor air quality (or the problem at hand). b) Convert the lessons learned into simple pieces of knowledge (for instance leaflets, articles), which would help citizen scientists taking similar action, or build on top of this experience. Eventually, this ould aid in the generation of relevant scientific journal or conference publications. With this, making policy assessments makes clear sense. Additionally, with the gathered information, one may take actions of advocacy in favour of certain public policies. Over time, another iteration may be done over the same problem: one would close the loop by gathering again to re-evaluate how the needs, and the situation have evolved over time, based on (hopefully) updated policies. And, possibly, undertaking new actions. When addressing a problem via CS, what is the most important part of a particular issue that bothers us? From the other side of the coin, why is this or that problem important to citizens? If we address it, are they likely to care, or to stay motivated? After, possibly, dreaming big, how do we address what we have set out to do? Our expertise and synergies with team mates and allies will come into play. Then again, when a plan is devised, what if it is too complex to be understood easily? The virtue of simplicity, both in concept, and in design is not to be overlooked. Simplicity, though, sometimes asks for longer thought than more complex, yet also more obvious approaches. Citizen scientists creating a project should likely keep in mind that the opening of communication channels with citizens implies a responsibility, and a certain degree of communication. With those open channels, leaving too many questions unanswered may thwart the success of a project... or, maybe, one may have to prepare for a strenuous communication work. Didactics and communication planning could hence make a great difference. -Give feedback on the results, about what you learned. People are curious! -Most importantly: put this information to work... Make it count! All subjects, addressed by the Citizen Science COST Action... join us once again, next time! A final quote by Wilhelm Busch, as offered by speaker Lukas Mocek, during his talk: “Persistence will be rewarded sooner or later!”. And so we hope! Many thanks go to Dr. Berk Anbaroğlu, for the insights which have allowed to write and inspire this article.